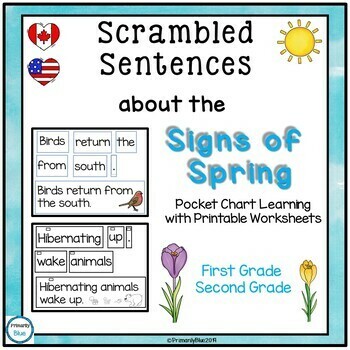 Scrambled Sentences about the Signs of Spring is a wonderful way to learn about, or to review, the Signs of Spring. This product will give your students hands-on practice with making sentences and putting words in the correct order to make a sentence. Plus, they gain practice with capitalization, punctuation, fluency, sight words, comprehension, and printing skills. Easy to Prep: print, cut, laminate, and learn! 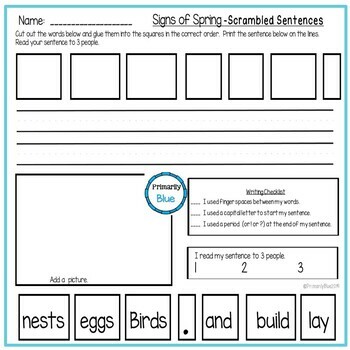 In total, there are 18 sentences about the Signs of Spring for your students to use. 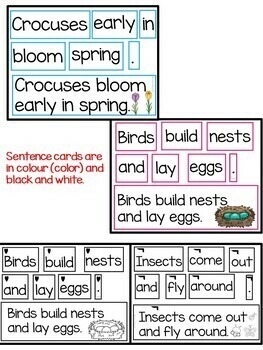 I use this product in literacy centers. 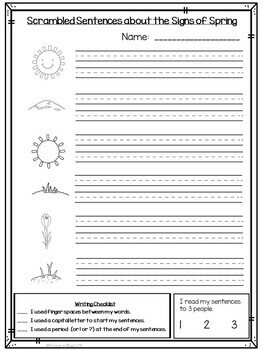 My students put the sentences together in a pocket chart, then print the sentences on a worksheet. Then they read to 3 friends. If you have any questions about this resource, please email me at primarilyblueresources@gmail.com . Let me know what you think! I value your feedback greatly as it helps me determine which products are most valuable for your classroom so I can create more for you. How to get TPT credit to use on future purchases: Please go to your “My Purchases” page. Beside each purchase, you'll see a “Provide Feedback” button. Simply click it and you will be taken to a page where you can give a quick rating and leave a short comment for the product. Each time you give feedback, TPT gives you feedback credits that you can use to lower the cost of your future purchases.